My first 3 cars were all mid-80’s K-Cars, and since they were all so similar I figured I’d just lump them into a single review rather than try and do them individually. This was my very first car, and though I only had it about 2 weeks, I remember it well. It was a maroon color, with the automatic shifter on the floor of the center console (unusual for this age of car – most automatic transmissions had the shift lever on the steering column). Although this was an old car when I bought it in 1996, it still ran just fine – and after all, it was my very first car! This was also (obviously) the first car to carry the name “Keithmobile” (I’m not very good at coming up with clever names for things). Sadly, I only had this car for about 2 weeks before it was totaled in an accident – I was hit side-on by a white late 80’s Ford F-250 quad-cab that ran a red light. “Plymouth Caravelle, 83-85” by 55allegro. Licensed under CC BY-SA 3.0 via Wikimedia Commons. My second car (the “Keithmobile-A”), purchased in haste after my first car was totaled in an accident – I had just gotten my first job (to pay for the car) and needed to drive to be able to get to work. Unfortunately, because I had to replace my previous car so quickly, I didn’t have time to look around for a good car and had to settle for what was available… Suffice it to say, the Caravelle was not a car I would’ve chosen if I’d had more time to look around. Although the Caravelle sounded good (on paper), it was in fact a piece of junk. The engine supposedly had a turbo, but it never worked, and the engine itself was barely functional. The suspension was worn out and the brakes were terrible. One memorable instance with this car was during a major blizzard when school was let out early – I could not get the car to start, and spent quite a while in the parking lot trying to get it going while the snow continued to fall. Once I did get it going (with just 1 headlight working, brakes that were in poor shape and tires that were nearly bald), I had a very, shall we say “exciting” drive home. I did not end up keeping this car very long, as eventually the repairs required exceeded the value of the car itself. My third car (the “Keithmobile-B”), and the last K-Car I owned. 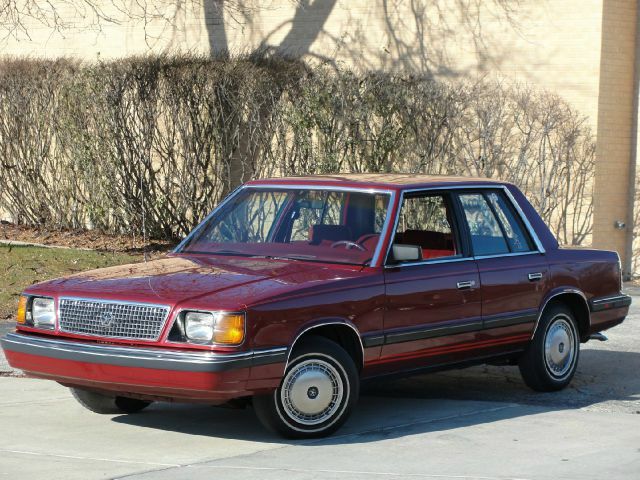 This was a 4-door sedan instead of the more usual 2-door coupe, purchased from a former Chrysler mechanic – which thankfully meant the car was in fairly good shape (for its age). This was the car that took me to my first year of college (or university as some countries would call it). It was also the K-car I had for the longest period of time – just under 2 years. Like all the K-cars I owned, this had a 2.2L inline-4 cylinder engine, and like all the other cars the ride and handling was absolutely pathetic – especially by modern-day standards. 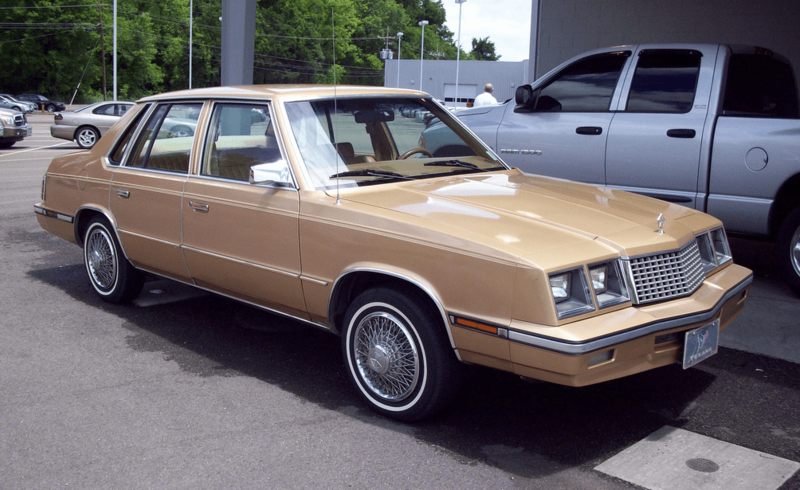 As was common at the time, all these cars were very similar – the Chrysler K platform of the time was used for an astounding number of different cars across all the brands – Chrysler, Plymouth, and Dodge – all of which were virtually identical mechanically speaking; differing mainly in trim & options. Each one of these cars was over 10 years old by the time I bought it – the newest one being the 1986 LeBaron that I bought in early 1997. 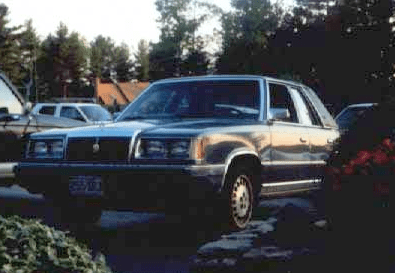 All of them had problems to greater or lesser extents – even the most reliable one (the LeBaron) had its share of mechanical issues. But then again, these were also very cheap cars – the cheapest was just $800; the most expensive was only $1,200. So, you get what you pay for, I suppose. It’s interesting to compare these cars against my current car – especially since my Outlander is (as of this writing) older than any of these cars were when I owned them, yet it is in much, much better shape – both mechanically and appearance-wise. Still, these were my first cars, and I’ll always remember them. Core Dump is made by Keith M. Survell, except for the stuff that isn't. Licensed under a Creative Commons Attribution-Noncommercial License. Do not taunt the happy-fun legal text.